[via womans day] Everyone has their own get-me-through-the-day caffeine vice, whether it’s a Starbucks latte or a daily Mountain Dew (or two). But in recent years, soda and coffee have taken a backseat to a new crop of super-charged energy drinks, sought after by athletes and truck drivers alike. While certain standout stars like Red Bull have claimed the most buzz along the way, the energy drink market is chockful of other competitive contenders. Read on for a flurry of facts about the most popular stimulant beverages around. From a surfer’s dream beverage to a party-hopper’s secret potion, these are the magical mixtures that keep our synapses firing and our hearts pumping. Lost Energy Drink is the lovechild of Hansen Beverage Company and Lost International, Inc. (the multimillion dollar surf industry icon). The visually-stimulating can, which sports Lost’s signature board and clothing apparel motifs, was designed to attract extreme sports enthusiasts, specifically the surfer and skater crowd. (The company’s signature slogan? “Ride all day; rage all night.”) Today the drink , which boasts a combined 5000 mg of energy-boosting substances like caffeine, guarana, ginseng and taurine, is still selling strong in surf-friendly areas of California. BAWLS is a carbonated beverage made with guarana, a naturally caffeinated berry grown in the Amazon. (The seed-like berry packs twice the amount of caffeine in a single coffee bean!) Conveniently, guarana also lends some serious flavor, which eliminates the need for high-fructose additives used in similar beverages. So what’s with its unusual name? According to bawls.com, the name BAWLS was inspired by the “bounce” the drink packs—but we’ll leave that for you to decide. This citrusy carbonated beverage was the Coca-Cola Company’s second attempt to launch an energy drink, following the failed launch of a product named KMZ. Clad in a black can bearing a Coke-esque logo, the drink—which contains 72 mg of caffeine per 8oz. serving (or more than three times the caffeine in a 12oz. can of Coca-Cola Classic)—is equally loved and patronized for its maker. However, since 2005, the popular sip has held strong, sweeping in 78 percent of the energy drink market sales in the United States. This low-carb beverage is the frontrunner of all the versions in its branded family of energy drinks, which also includes M-80 Energy + Juice, Monster Energy XXL, Monster Energy Assault and Khaos Energy Juice, among other varieties. (Monster Energy Drink was created by Hansen Beverage Company, also of Lost Energy Drink fame.) According to customer reviews, the low-sugar incarnation of the Monster drink not only lowered the calorie count, but also improved the flavor of the beverage, lessening its medicinal aftertaste. Still left intact, however, was its energy-restoring combination of caffeine (160 mg per can), ginseng, guarana and B-Vitamin. Red Bull, the world’s leading energy drink, was originally modeled and named after a Thai energy drink called Krating Daeng (Krating = Bull; Daeng = Red). First marketed in Eastern Europe in 1987, the familiar blue-and-silver beverage had already reached sales in the hundreds of millions by the time it debuted in America in 1997. Rumor has it that along the way, its makers altered the drink’s flavor to please Western palates, adding bubbles and increasing the caffeine content, which stands at 80 mg per can. (In 2003 distributors also released the popular sugar-free version of the beverage.) Today, sales easily reach in the hundreds of billions each year. Made with a powerful combination of vitamins, taurine, guarana, inositol, carnitine, ginkgo, eleutherococcus senticosus and Milk Thistle (a plant that herbalists have used for thousands of years to treat and protect the liver), Rockstar hit the energy drink scene with a bang in 2005 when it signed on with its current distributor, The Coca Cola Company. (They’ve just announced their switch to PepsiCo by summer 2009, however.) Today it’s beloved as much for its haute gold-rimmed can as it is for its cotton-candy flavor. Radioactive Energy Drink comes in a 16oz. black can sporting a nuclear warning sign in fluorescent yellow. (Marketing catchphrase? “Catch the Glow.”) A taurinerules.com review describes it as one of the best berry energy drinks around, with a flavor that mingles citrus with hints of raspberry. Fans are quick to point out its generous vitamin B12 content (5000% of the daily recommended value) and the quick boost lent by its potent combination of guarana, taurine, carnitine and Siberian ginseng—enough to make loyalists turn a blind eye to the drink’s high calorie count (220 per serving). Sobe Adrenaline Rush was the South Beach Beverage Company’s second foray into the energy drink market, and it outpaced its predecessor, Sobe No Fear Energy Drink, with its pleasing passion fruit flavor. A 16oz. 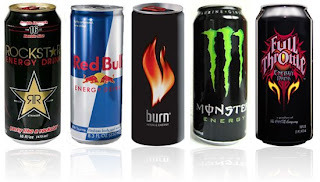 can of the drink contains 152 mg of caffeine, which is comparable to most energy drinks on the market, but also includes other “natural” energizing ingredients such as d-ribose, l-carnitine and taurine. According to manapotions.com, Mana Energy Potion was made for gamers by gamers and collected two prizes in the 2008 Screaming Energy Drink Award roundup—“Coolest Packaging” and “Most Original.” Its sugar-free, vitamin-rich blend is intended to keep you up through long nights of gaming and celebrating—sans the inevitable caffeine crash. The drink is intended to be taken as a shot, and according to thinkgeek.com, each serving contains as much buzz-you-up caffeine as two Red Bulls or 4 cups of regular-strength coffee.